and you must decide if you want to act or react, deal your own cards or play with a stacked deck. And if you don't decide which way to play with life, it always plays with you." Three years ago, June 5, 2006 to be exact, Jim was the victim of a rattlesnake bite during a trail run through the Tongue River Canyon. I'm not going to overly-dramatize the incident and say he was scarred for life, but it was one of the most traumatic events he's ever experienced and he'll never forget it. The incident definitely affected me, too. I was there when it happened and wrote about it in this journal as a cautionary tale for other folks. It could just as easily have been me. The rattler that bit Jim 6-5-06; we didn't kill it. Same day, two miles away: someone else killed this one. Talk about being well-warned! But Jim still landed right on top of an angry rattler that was very much ALIVE (and probably still is). Jim's bite was on his ankle (see the puncture wound?) but the venom quickly coursed up his leg. the nearest hospital had enough vials of anti-venom to begin treatment (they had to rush more vials from another hospital an hour away to complete the treatment). 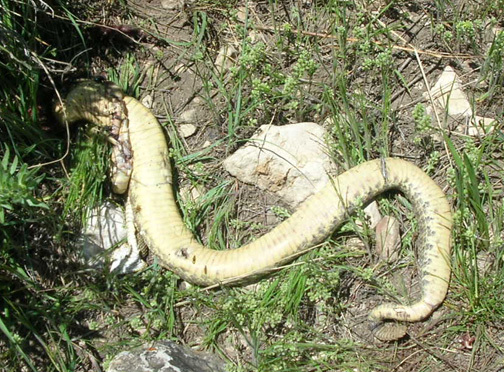 It's critical that anti-venom serum be administered within a few hours or necrosis sets in (death of tissue). It took about two hours before Jim was in the hospital in Sheridan and the treatment began; although he was in a great deal of pain and his foot, ankle, and leg were considerably swollen, he did not suffer permanent tissue damage to our knowledge. He did experience a delayed allergic reaction to one of the types of anti-venom ten serum days later (on race day!) and had to be treated a second time at the hospital so his airways weren't blocked from the swelling he had in his face and throat. That was almost as scary as the bite. It was also more than a little disconcerting to find the emergency room doctor on duty when Jim was first admitted (not the doctor pictured above) on his computer, searching the internet to determine the appropriate treatment!! To our amazement, the hospital rarely gets rattlesnake bite patients. That surprises me, considering how many rattler sightings we've heard about in the nearby canyons. The whole incident, including two hospitalizations (one overnight), meds, and follow-up doctor visits, cost well over $20,000. Most of that was for the six vials of anti-venom Jim required. It could have been worse. Rattlesnake experts say it was probably an older snake that bit Jim; it did have a bunch of rattles, shown in the blurry close-up below. The older the rattler, the less venom it usually secretes in a bite. It has learned to conserve its venom. A younger snake might have given a more powerful dose, causing more damage to both Jim's leg and our wallets. Our guy had lots of rattles. Jim's most excellent insurance covered most of the cost. When we've told the tale to friends since then, some have visibly flinched or swallowed hard, thinking about their huge deductibles and/or miserly coverage. At least we didn't suffer too badly in that regard. My insurance wouldn't have paid as well as Jim's but it wouldn't have put us in the Poor House, either. 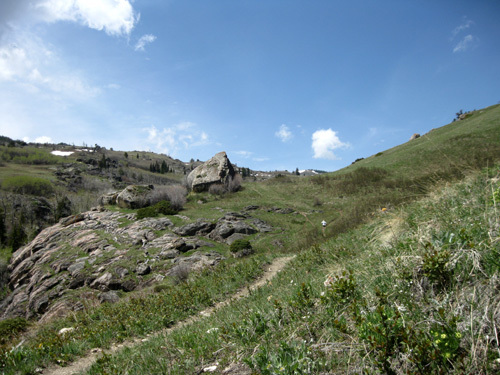 Since this incident Jim and I have been even more guarded during trail runs all around the country, especially those through rocky areas in forests and canyons. Let's just say our "rattlesnake radar" is on full alert. We know Cody is at risk for rattlesnake bites, too, so we usually don't let him run with us through terrain we deem risky. After Jim's bite three years ago we made the comment in this journal and to the internet ultra running list that we didn't kill the snake that bit him. It wasn't out of empathy for the snake, I can assure you of that! We knew we needed to get back to the truck ASAP (but without running) and we didn't have anything to kill it with anyway. We later learned that some medical practitioners say it's a good idea to kill the snake and take it with you to the hospital so the proper life-saving treatment can be given. There are many kinds of poisonous snakes and not every type of anti-venom serum works effectively on every kind of snake bite. Well, let me tell you, that casual comment unleashed a minor maelstrom of protests from the PETA crowd!! 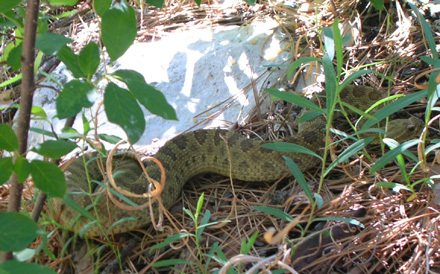 We got a couple scathing e-mails from total strangers about how terrible it is to even think about killing a rattlesnake, and others that were just plaintive, pleading with us to reconsider ever killing one. I'm going to be very blunt here. If you are of this mindset, stop reading this entry immediately because you aren't going to like what I'm going to say next! And if you foolishly read on, don't bother to write to us about being murderers. I usually try to be at my diplomatic best in this journal (not always successfully) but in this case, we don't care what you think and we will not engage in a dialogue with you about the morality of killing poisonous snakes. Unless or until you have been at the receiving end of a potentially fatal snake bite, you have no right to tell someone else what they should or shouldn't do. Or even if you have been bitten, for that matter . . .
For the more tolerant and less squeamish of you, here's the current story. 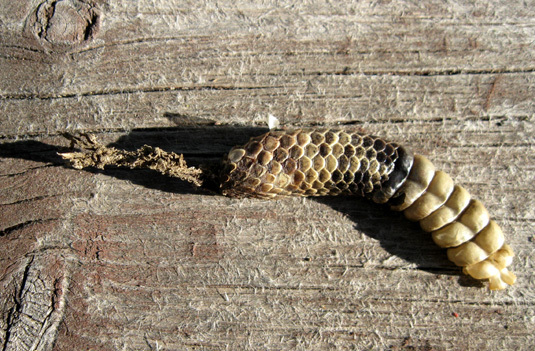 My brother, who is deathly afraid of even non-poisonous snakes, should enjoy this tale (tail?). 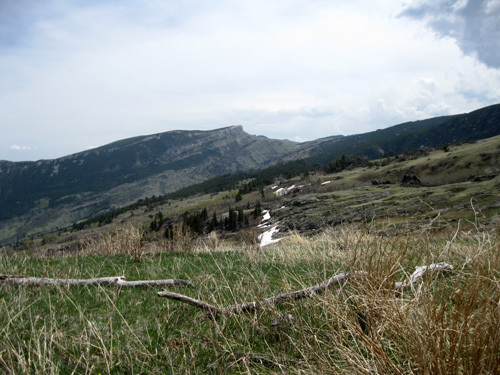 Jim did a solo run/hike this morning through the Tongue River Canyon and up to Horse Creek Ridge, the same out-and-back course described in the May 23 entry. He didn't have his camera with him so three of the photos below are ones I took during that run. 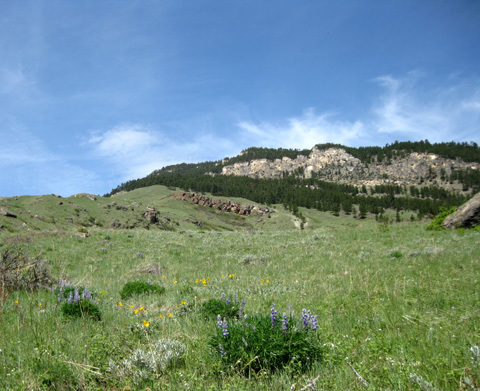 Lupines in bloom at about 5,500 feet in the upper canyon area. Jim was on full rattler alert through the canyon where he was bitten previously. 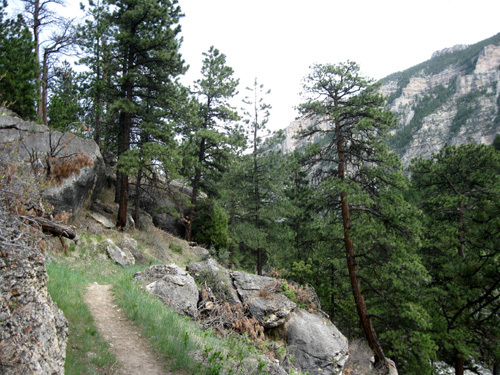 So far, so good, he thought as he climbed higher and higher through the canyon and above most of the trees. Even though we've seen dead rattlers three or four miles up in the meadow, we do tend to relax our guard a bit more up there. About four miles into the run (hike, at this point), shortly before the first aspen grove, Jim heard a cricket-chirping sound. He'd been hearing various birds and insects all the way up the canyon, but this sound was a little different and caught his attention. Thank goodness he wasn't listening to his MP3. He looked in the direction of the "chirping" and saw a six-foot rattler about five feet away, in the middle of the trail, coiled up and ready to strike!! He says it just about scared the crap out of him. In retelling it later he's able to laugh about his instinctive response to avoid landing on the snake and describe how he "must have jumped ten feet in the air and ten feet over." Once Jim's adrenaline and heart rate returned more to normal a dilemma still remained: how and whether to get past the PO'd snake, which was still right smack dab in the middle of the trail. This was an out-and-back run. Jim had two choices: turn around and cut his run short, or detour around the snake and be paranoid the rest of the way up to the ridge and back, wondering where it would be on his return trip past this very same spot. He didn't like either alternative. He thought not only about his own safety but also about the safety of other runners he had seen on the trail that day -- three women hiking behind him, several Forest Service workers who were carrying out trash some slobs had left behind during the weekend, and others he may not know about. 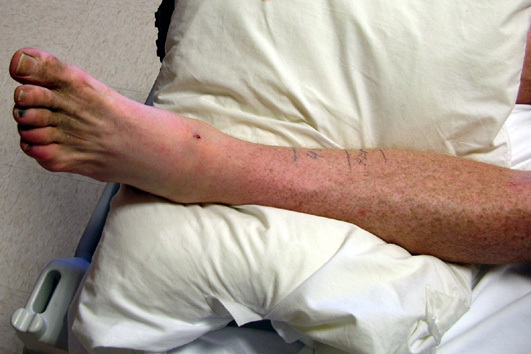 What if someone got bitten, especially someone who is more allergic to snake bites than he is, someone who couldn't get to the hospital in a timely manner, or someone with lousy (or no) insurance? As an EMT and General Nice Guy, that bothered him. What he did next was mostly altruistic and partly revenge: he slew the dragon. It took a while because he didn't have a knife or trekking pole or sharp stick. He had to use big rocks. Repeatedly, even though his aim was pretty good. Don't ever forget that fact. It could save your life, or a lot of grief, anyway. Jim left the dead rattler in the middle of the trail, just as another person did three years ago in the photo I showed earlier, as a reminder for other trail users to be careful not only in the rocky canyon area, but also in a peaceful, sunny meadow full of flowers. You don't have to stick your hand between rocks to get bitten. It can happen anywhere rattlers live. Jim continued on his run, shaken but feeling like he'd done the right thing to protect not only himself but also others. It was a little nerve-wracking for him to return to the scene of the carnage on the way back down the valley but he detoured gingerly around the dead snake (just in case! ), fingered the rattles in his pocket, and finished out his twelve-mile run. This experience was probably pretty therapeutic for Jim and I don't blame him one bit for killing the snake. I consider it a public service. And it's one less snake I have to worry about the next time I'm up there! Simple as that. My day was much less dramatic until Jim came home. After taking care of some financial and medical business, finding a place to board Cody during the race in case we can't find a pet sitter in the campground, and ordering some Hammer Nutrition products to replenish our supply, Cody and I walked around the campground and ran the nearby park loops several times. In the afternoon I started riding our mountain bike out the Tongue River Road (above), thinking I might see Jim on his way back from his run in the canyon. I didn't get very far, though. 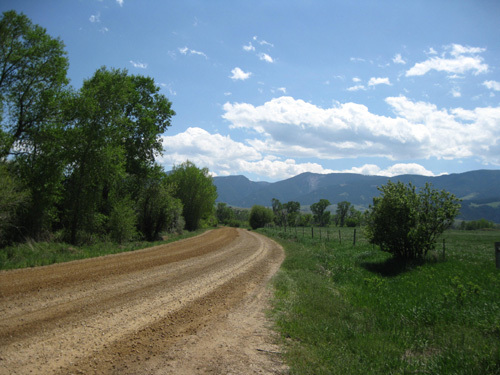 The county was in the process of grading and watering the road to keep dust down and it was simply too hard for me to muscle my way through the soft dirt, rocks, and mud. It would have been OK for running but I'll have to wait a few days for it to get packed down more before I can ride it. I finished my ride on pavement. After supper I took another walk around the campground with Cody and met a most interesting fella who was setting up camp next to the river. He was obviously bike-touring and I was more than curious to see where he'd been and where he was going. His name is Scott Mullin. We had an interesting conversation about his six-month (or longer) tour of the country from Florida to Alaska. He's gotten stronger and stronger the farther he's ridden, similar to journey runners, and he dreams about continuing on an around-the-world cycling tour if everything falls into place. Scott said he was laid off his IT job after 13 years and decided to have some fun. I've heard of lots of folks who are doing the Appalachian Trail and other lengthy adventures this year because of job-loss "opportunities" like this that they wouldn't ordinarily have during their working years. What a great way for them to turn a negative into a positive. The picture of health and happiness! "No mortgage� no wife� no kids� and now no job� what�s a guy living in South Florida to do? Jump on a bike and ride to Alaska of course. I�ve always known I�d end up doing something different with my life. 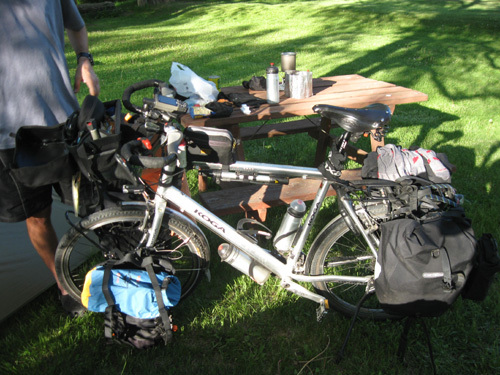 Considering some of the things I�ve already done maybe a bike tour around the world isn�t that much of a stretch? It�s certainly shaping up to be rather epic though. Alaska is just the first destination. When I make it up there the plan is to head down to South America and then over to New Zealand and then Australia. After that wherever the road (or a boat) takes me." I love his spirit and sense of adventure! 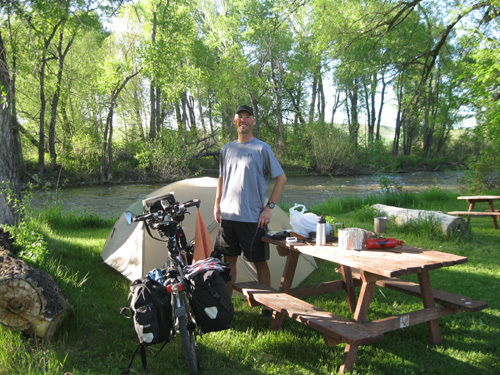 Scott has outfitted his bicycle with 80 pounds of gear and supplies -- not exactly ultra-light cycling, but he has a strong, athletic build and has been maintaining a consistent pace so far across the country. He carries a laptop computer, GPS, cell phone, digital camera, and other high-tech equipment to maintain his website, conduct personal business, and stay in contact with folks via e-mail. He stays in campgrounds each night so he can get internet connections and take showers. He has time each evening to relax, write, update his website, surf the internet, eat a decent meal, chat with curious folks like me, and get ready for his next day's ride. He sticks to paved roads and replenishes his supplies in the towns through which he passes. Although we didn't have time to talk about all the adventures he's had, Scott did tell me some interesting stories from the road. I'm surprised how many other journey cyclists he's met along the way. I went to sleep dreaming of the possibilities . . .